They may not be as young as they once were, but ask any age and they'll know straight away who Iron Maiden are. They're still relevant and important as ever. Just take a listen to one of the biggest singles of 2001 and hear the middle eight of Wheatus' single "Teenage Dirtbag" for the line "got two tickets for Iron Maiden baby" or the scene in Bill and Teds Excellent Adventure when the hapless duo are ordered to be taken to the Iron Maiden and they mime the guitars, nod their heads and proclaim excellent!!!! If the likes of Linkin Park and Limp Bizkit are nu-metal then Iron Maiden of true metal through and though and proud of it. The wrinkly rockers have released a live album "Rock In Rio" which captures them at their best. Recorded at the Rock In Rio III festival last year it features the single "Run To The Hills" which was released a few weeks ago. The unmistakable Bruce Dickinson is back on top form with his band. Fans will already know that he only returned recently after Blaze Bailer formerly of Wolfsband left so they could get back to the winning line-up again. I know its not the same as actually being there in the pit, but its still a great reminder of a band who are as popular in this century as they were in the last. You can hear the music and the roar of the crowd, but sadly to experience the pyrotechnics you need to have actually attended the festival. So until a live video or DVD is released (which is highly likely) you'll have to use your imagination or just jump around the living room in beer and sweat soaked denim. Young metal fans should give this a listen (or older brothers should slip it n between the pile of Nu-Metal next to their bed) as they'll no doubt love every minute of it. 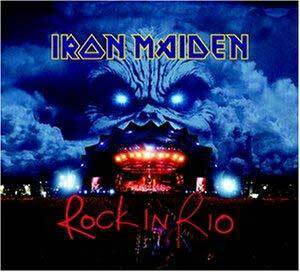 It may not be new material, their last album was "Brave New World", but as a live greatest hits compilation "Rock In Rio" really does deliver the goods in a way one Iron Maiden can. On a serious not I should add that the band are having a series of benefit shows in Brixton this month with all proceeds from the gigs going to former drummer Clive Burr's Multiple Sclerosis Trust Fund.